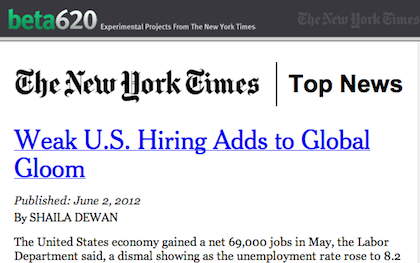 The New York Times has released a new set of browser extensions that will allow eager readers to try out experimental features on the NYTimes.com website. The project, dubbed Test Drive, is from the newspaper’s experimental arm beta620. Some of the features of Test Drive include NYT Accessible, which optimises the site for readers with visual impairments and TimesInstant, similar to Google Instant search, that produces results as you type. The features have been available for a while but on a separate site, the new browser extensions, available for Firefox and Chrome, allow the projects to be viewed in context on their main website. We love beta620 — it’s been a great experience and a great way to get our innovations in front of the public before they’re fully baked. It’s not like a traditional A/B test where you’re actually just throwing something else up on unsuspecting readers and measuring your clicks. I think the quantitative data will be less important here than the qualitative, where people’s comments and our own understanding of how we’re using these tools and experience will be more important than measuring clickthroughs or that sort of thing. Full story at Nieman Journalism Lab. This entry was posted in Online Journalism and tagged accesibility, beta, developers, experimental features, instant search, New York Times on June 1, 2012 by Daniel Bentley. 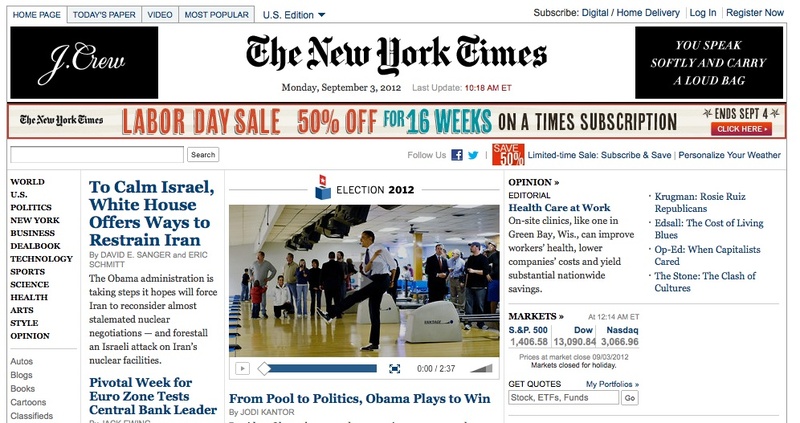 The New York Times is among several US media outlets to adopt a new-style Facebook page. The page makes the most of the timeline feature, adding photos and anecdotes from the Grey Lady’s 160-year history, inviting readers in to the newsroom. We’re pleased to introduce our timeline, which highlights select moments from our 160+ year history. Come into the newsroom on the night of the 1928 presidential election. See our reporters at work during the 1977 blackout. You’ll even find a guest appearance by Marilyn Monroe in the 1950s. We plan to update our http://www.facebook.com/nytimes timeline frequently with key milestones from 1851 through the present. Take a look and let us know what you think. The new-style pages were announced by Facebook today, already adopted by US TV show Today and People, and were among a number of features released at the Facebook Marketing Conference (fMC) in New York City. Facebook describes the layout, which “includes a cover photo, larger story sizes, better tools to manage a page and more”, as designed to “help business and organisations better share their story and connect with people”. Update: There are a couple of handy posts on how to create a great news-style Facebook page and timeline for your news organisation. Here is some advice from Lost Remote and here are a few tips from Zombie Journalism. This entry was posted in Social media and blogging and tagged Facebook, facebook page, New York Times on February 29, 2012 by Sarah Marshall. The George Polk Awards, run by Long Island University, announced the winners of its 63rd event today. According to a release the New York Times won two of the 15 categories. The first, for military reporting, was awarded to CJ Chivers, and the second was the foreign reporting prize which went to Jeffrey Gettleman and Tyler Hicks for their “numerous exclusives and heart-wrenching photos of ethnic conflict, pillage, famine and piracy”. It was also announced that Anthony Shadid, the New York Times foreign correspondent who died from an apparent asthma attack in Syria last week, will receive a posthumous award “for extraordinary valor for his work in the Middle East”. Other winners include the Wall Street Journal, the Associated Press, the New Yorker and the Boston Globe. This entry was posted in Awards, Journalism and tagged anthony shadid, Awards, George Polk awards, New York Times, us on February 20, 2012 by Rachel Bartlett. This entry was posted in Journalism and tagged New York Times, Rupert Murdoch, thurlbeck, top 10 on February 17, 2012 by Paul McNally. How is it of use to journalists? 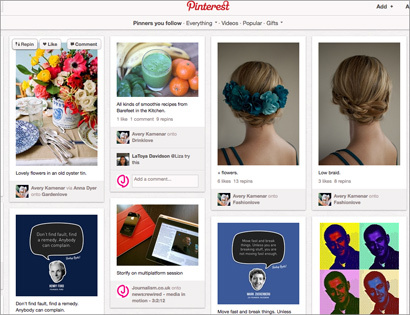 Pinterest has been growing in popularity recently. It is a virtual bookmarking system that can be used by newsrooms to curate and share news. Indeed Liz Heron, social media editor of the New York Times (NYT), suggested at last week’s news:rewired conference that NYT will be joining. Pinterest is one up and coming platform, but we’re still figuring out what the community wants there and how we can deliver something new. You’ll see us there soon. Journalism.co.uk has since created a Pinterest account and has used it to collate blog posts from news:rewired. It is invite-only at the moment but we have a handful to share. Email us using this link if you would like one. This entry was posted in Social media and blogging, Tool of the Week and tagged Liz Heron, New York Times, Pinterest on February 7, 2012 by Sarah Marshall. Beet.tv has an interview with Ann Derry, editorial director for video and television for the New York Times and Shawn Bender, editorial director for video for the Wall Street Journal online. They explain “why readers click the play button” to watch videos on the two news sites. Bender feels readers click play in order to feel a connection. I think that there is a feeling of excitement about the news that you don’t get in the static environment of print that you can get in video. Derry says that both news sites have had to educate their readers in order to consume news in video form online. We’ve had to train our users, both at the Journal and at the Times, that if you click on something you get a good experience. Bender goes on to say that concise videos where the reader/viewer can learn two or three points are the most successful. Derry adds that news video should offer the reader/viewer a quicker, more “efficient” way of accessing the story than if they had chosen to read it as text. The Beet.tv video is at this link and below. This entry was posted in Editors' pick, Multimedia and tagged beet tv, New York Times, online video, Wall Street Journal on December 5, 2011 by Sarah Marshall. Poynter has an interesting post highlighting the overhaul of the New York Times’ commenting system. The news outlet has introduced “trusted commenters“, which the Times describes as an “invitation-only programme designed for our most valued commenters”. Those who have proved to be trusted by consistently having comments approved will be allowed to leave comments that will be made live immediately without the need for moderation. 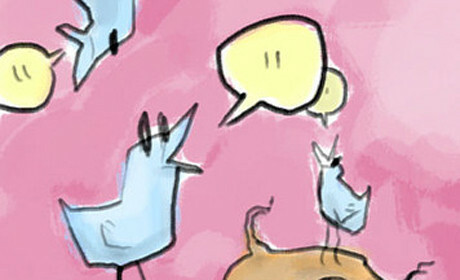 In exchange they get instant commenting, as well as a higher profile on the site. With a special “trusted” logo attached to their color photo and full name, they stand out visually from the other commenters who usually have an anonymous username and no profile photo. Sonderman’s full post on how New York Times’ overhaul of its comment system and how it grants privileges to trusted readers is at this link. This entry was posted in Editors' pick, Online Journalism and tagged Jeff Sonderman, New York Times, online communities, poynter on December 1, 2011 by Sarah Marshall.